I admit that this year my photographic activities were rather low. Therefore I am even more proud to announce that in the VTNÖ Competition 2014, my picture “Yellow Warbler” was selected as “Highlight” in the “Golden Light” (Goldenes Licht) category. These are the winning pictures. The quality of the submitted material was amazing and we had some discussions about surprising jury selections. Nevertheless, congratulations to all winners and especially to Horst Ender for being Nature Photographer of 2014! I took this picture early in the morning, on the last day of our trip to the Galapagos islands. I was actually taking pictures of young seals, when I noticed this bird behind me. 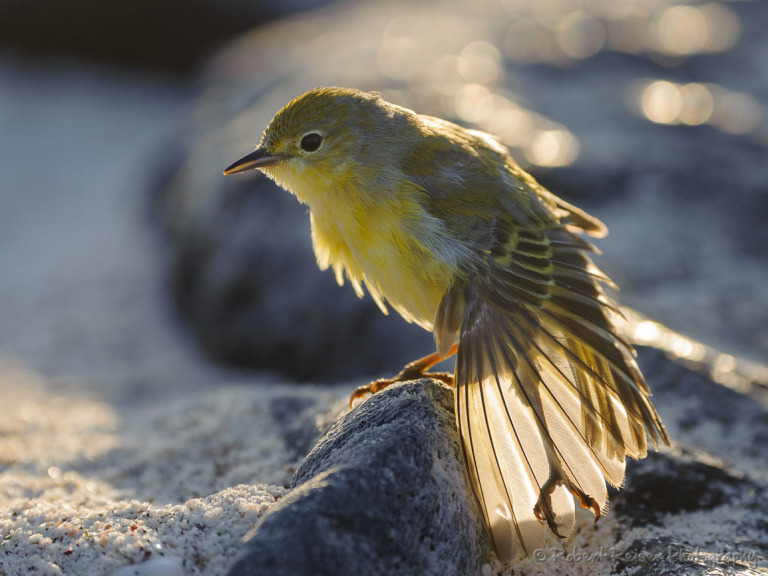 Yellow warblers are tiny, no bigger than approximately 10 centimeters. He was enjoying the rising sun, and stretching his wings and legs. As with all the other animals on Galapagos, this bird didn’t mind me sitting really close to it. I used the opportunity, got on the ground and got even closer to it. The light was just beautiful, it was a very warm back light. I was able to see every detail of the wing feathers. The Yellow Warbler did continue with his stretching exercises for about 5 minutes, and I was able to take a lot of pictures. Why have I chosen this specific picture for the VTNÖ Competition 2014? I found it was visually the most impressive shot, with the rim light, the stretched wing and the shadow of the stretched leg behind the wing. The only thing left to do was to brighten the shadows a tiny bit, they were really dark because of the back light. After a small contrast increase and a crop to a more pleasing format, I submitted the picture to the contest.